Are you sick of seeing Instagram shots of your friends soaking up the sun offshore? In the grip of winter, those grey skies and rainy days call for summer-inspired makeup. Guerlain is sharing a shot of bronze in their new collection - the very thing your skin needs right now. Editor Trudi Brewer highlights her favourites from the range. The Guerlain Terracotta Summer Escape collection is a range of complexion-enhancing foundation and golden shimmery powder, with a pop of bold colour for the lips and nails. 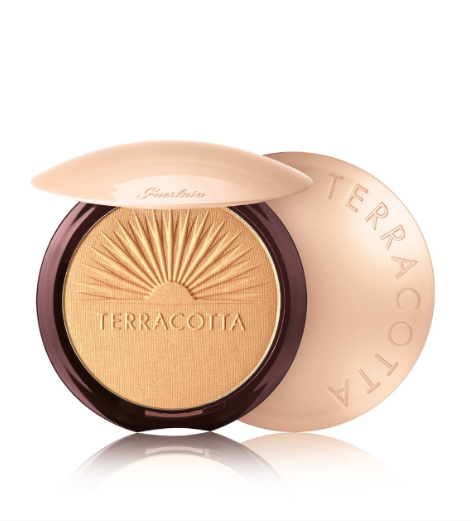 Guerlain Terracotta Summer Glow Golden Glow Powder Highlighter, $90. We are used to cheating a summer glow here at BEQ and this powder suits the entire team. To accentuate your best assets, from the cheekbones to the collarbones, the shimmer in this powder gives skin that summer holiday glow in minutes. With a fluffy brush to the high points of the face, brow bone, cheekbones and temples. Or to add shimmer to the decollete, buffed onto the collarbones. Guerlain Terracotta Cushion Fresh Bronzing Fluid Makeup, $87 (there are two shades). While cushion foundations are nothing new, this new addition boasts a skin-enhancing ingredient that adds long-term radiance to the skin, while you wear it. It's like a skin enhancer more than a foundation, you can wear alone to add that luminous bronze glow, or mixed with your regular foundation. The addition of an SPF 20 is brilliant, and best of all - it's travel-friendly. 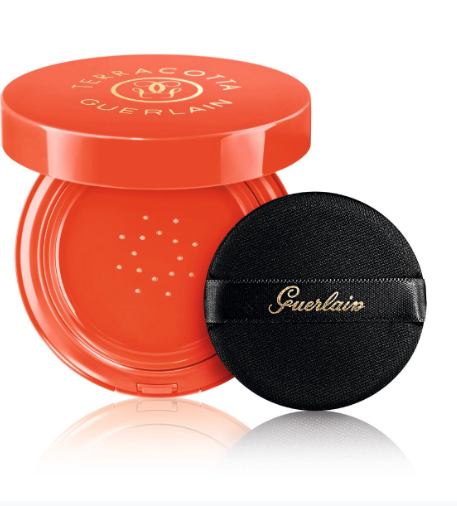 Thanks, Guerlain for making the compact a vibrant orange colour, we can easily find this one in our handbag. The fluid formula makes it so easy to apply. Simply push the compact down, and tiny dots of makeup will appear in the case. You can use the sponge supplied, but we like to buff it on the skin with a foundation brush to get a seamless finish. Why do we like this collection? Guerlain makeup smells divine (like roses), the packaging is so luxurious, and the finish gives your skin the polish it needs to look its very best for hours. This collection reminds us of how good you feel when on a romantic, summer holiday. So if you're not jetting off anywhere exotic anytime soon, a piece of this collection will give you an instant feel-good vibe. Guerlain Terracotta Cushion, Fresh and sun-kissed fluid foundation SPF 20, $87. 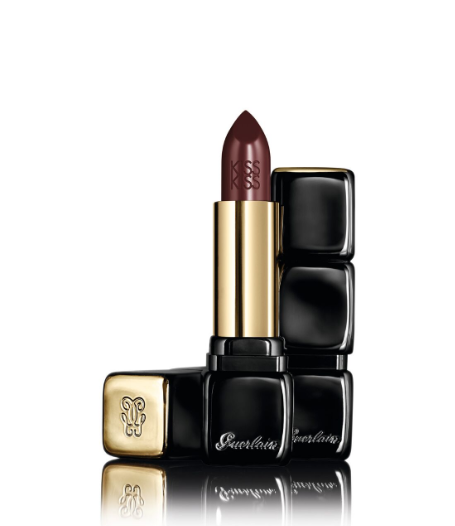 Guerlain La Petite Robe Noire Nail Colour, East Poppy 044, $42. Guerlain Terracotta Summer Glow Highlighter, $90. Guerlain KissKiss Lipstick in West Wood, $60. Available at Smith & Caughey, Ballantynes and David Jones shop the collection here.